Synthetic peptide within Human CD3 aa 150 to the C-terminus. The exact sequence is proprietary. WB: Recombinant Human CD3 epsilon protein (ab114153), Jurkat whole cell lysate. Human, mouse and rat thymus tissue lysate. IHC-P: Pig and rat spleen tissue. Human tonsil tissue. Mouse epidydimal fat pad tissue. Rat infarcted heart tissue. Flow Cytometry: Human peripheral blood lymphocytes. Jurkat cells. IHC-Fr: Mouse brain tissue. We recommend ab135372 as an alternative. 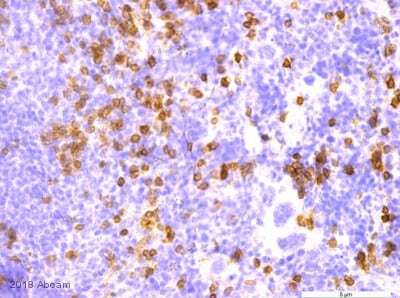 This antibody is suitable for staining normal and neoplastic T cells in formalin-fixed, paraffin-embedded tissues. Our Abpromise guarantee covers the use of ab16669 in the following tested applications. IHC-P 1/150. Perform heat mediated antigen retrieval with citrate buffer pH 6 before commencing with IHC staining protocol. Boil tissue section in 10mM citrate buffer, pH 6.0 for 10 min followed by cooling at room temperature for 20 min. WB 1/200. Predicted molecular weight: 23 kDa. Immunohistochemical analysis of Formaldehyde fixed, paraffin-embedded pig spleen tissue sections labelling CD3 with ab16669 at a dilution of 1/100. Biotin conjugated Goat Anti-Rabbit IgG was used as the secondary antibody. Antigen retrieval was heat mediated using citric acid. Human peripheral blood lymphocytes stained with ab16669 (red line). Human whole blood was processed using a modified protocol based on Chow et al, 2005 (PMID: 16080188). In brief, human whole blood was fixed in 4% formaldehyde (methanol-free) for 10 min at 22°C. Red blood cells were then lyzed by the addition of Triton X-100 (final concentration - 0.1%) for 15 min at 37°C. For experimentation, cells were treated with 50% methanol (-20°C) for 15 min at 4°C. Cells were then incubated with the antibody (ab16669, 1/1000 dilution) for 30 min at 4°C. The secondary antibody used was Goat Anti-Rabbit IgG H&L (Alexa Fluor® 488) (ab150077) secondary antibody at 1/2000 dilution for 30 min at 4°C. Isotype control antibody (black line) was rabbit IgG (monoclonal) (1μg/1x106 cells) used under the same conditions. Unlabelled sample (blue line) was also used as a control. Acquisition of >30,000 total events were collected using a 20mW Argon ion laser (488nm) and 525/30 bandpass filter. Gating strategy - peripheral blood lymphocytes. Lanes 1 - 6: Merged signal (red and green). Green – ab16669 observed at 23 kDa. Red - loading control, ab8245, observed at 37 kDa. This blot was produced using a 4-12% Bis-tris gel under the MES buffer system. The gel was run at 200V for 50 minutes before being transferred onto a Nitrocellulose membrane at 30V for 70 minutes. The membrane was then blocked for an hour using Licor blocking buffer before being incubated with ab16669 and ab8245 (loading control) overnight at 4°C. Antibody binding was detected using Goat Goat anti-Rabbit IgG H&L (IRDye® 800CW) preadsorbed (ab216773) and Goat anti-Mouse IgG H&L (IRDye® 680RD) preadsorbed (ab216776) at a 1:10000 dilution for 1hr at room temperature and then imaged. Immunohistochemistry (Formalin/PFA-fixed paraffin-embedded sections) - Anti-CD3 antibody [SP7] (ab16669)Image from Graff JN et al.,Oncotarget 7(33), 52810 - 52817. Fig 2,; doi: 10.18632/oncotarget.10547. 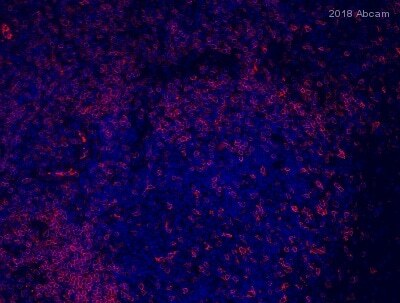 IHC using multi-spectral imaging on human lymph node (A-C) obtained from men with mCRPC. A) H+E staining and B) single-color images (plus nuclear stain; DAPI) of CD3 (ab16669), CD8 (ab101500), CD163, PD-L1, cytokeratin (CK), DAPI and C) merged. H+E stating at 20X magnification; multi-spectral images 200X magnification. Immunohistochemical analysis of Formaldehyde fixed, frozen rat spleen tissue sections labelling CD3 with ab16669 at a dilution of 1/500. Biotin conjugated Goat Anti-Rabbit IgG at 1/300 dilution was used as the secondary antibody. Cryostat sections (10 microns thick) of fresh frozen spleen were dried overnight. They were fixed in 10% Formalin in PBS pH7 for 15 minutes. After secondary antibody incubation ( Goat anti-rabbit biotin) , streptavidin-Alexa 594 was applied. Immunohistochemical (Formalin / PFA fixed paraffin-embedded sections) staining of of Tonsil tissue labeling CD3 (SP7) with ab16669 at 1/150 dilution. Immunohistochemical analysis of Formaldehyde fixed, paraffin-embedded rat spleen tissue sections labelling CD3 with ab16669 at a dilution of 1/100. Biotin conjugated Goat Anti-Rabbit IgG at 1/300 dilution was used as the secondary antibody. Antigen retrieval was heat mediated using citric acid. Immunohistochemistry (Formalin/PFA-fixed paraffin-embedded sections) - Anti-CD3 antibody [SP7] (ab16669)This image is courtesy of an Abreview submitted by Ying Li. Ab16669 staining CD3 in Mouse Epidydimal fat pad tissue sections by Immunohistochemistry (Formalin/PFA-fixed paraffin embedded sections). Tissue sections were fixed with formaldehyde, blocked with 5% serum for 4 hours at 25°C and permeabilized with Triton X-100. Samples were incubated with primary antibody (1/100 in PBST with BSA and goat serum) for 4°C at 12 hours. 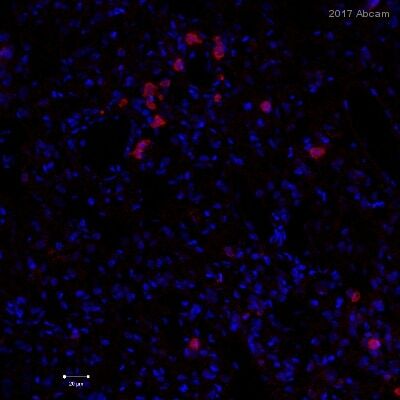 An Alexa Fluor® 568 goat anti-rabbit IgG (H + L) cross adsorbed was used as the secondary antibody. Flow cytometric analysis of rabbit anti-CD3 (SP7) antibody ab16669 (1/100) in Jurkats cells (green) compare to negative control of rabbit IgG (blue). Human tonsil stained with ab16669. ab16669 staining rat infarcted heart tissue by Immunohistochemistry (Formalin/PFA-fixed paraffin-embedded sections). Myocardial infarction was produced in a rat model following the ligation of the left anterior descending (LAD) coronary artery. Tissue was harvested 6 w following infarct, fixed with Histochoice for 72 hr, paraffin sectioned and the slide was then baked prior to CD3 staining. ab16669 at 1/200 was incubated overnight at 4°C. The image was taken with a confocal laser scanning microscope and shows cells giving strong inmmunofluorescence staining for CD3 antigen (green), indicating presence of cells of T-lymphocytes origin in the infarct zone of the heart tissue, counterstained nuclei with DAPI (blue). Note, CD3 tended to be present in nests of 2-5 cells that were non-uniformly distributed in the infarct zone. In addition, the image shows that the CD3 localization is predominantly membrane based and to a certain extent intracytoplasmic. 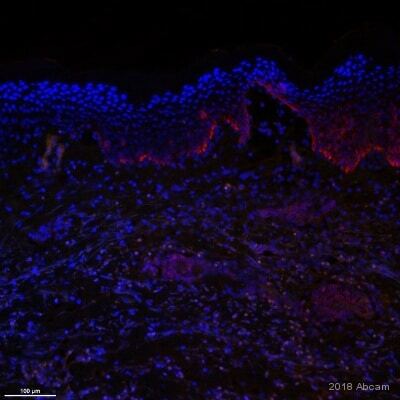 Immunohistochemistry (Frozen sections) - Anti-CD3 antibody [SP7] (ab16669)Image courtesy of an anonymous Abreview. ab16669 staining CD3 in murine brain tissue by Immunohistochemistry (Frozen sections). Tissue was fixed in acetone, blocked using 5% serum for 30 minutes at 25°C and then incubated with ab16669 at a 1/200 dilution for 18 hours at 4°C. The secondary used was an undiluted HRP conjugated goat anti-rabbit polyclonal. 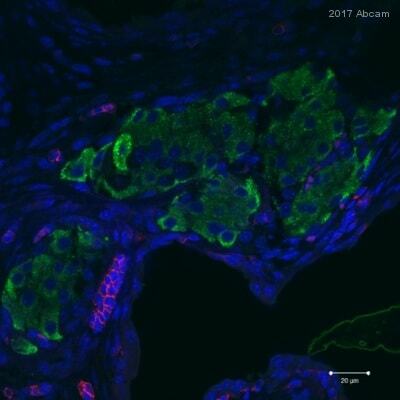 Immunohistochemistry (Formalin/PFA-fixed paraffin-embedded sections) - Anti-CD3 antibody [SP7] (ab16669)Image from Moussion C et al., PLoS One. 2008 Oct 6;3(10):e3331. Fig 2.; doi:10.1371/journal.pone.0003331; October 6, 2008, PLoS ONE 3(10): e3331. Immunohistochemical analysis of Human tonsil tissue, staining CD3 (green) with ab16669. Antigen retrieval was performed by heat mediation in citrate buffer (pH 6) and blocked with 5% goat serum and 5% BSA for 1 hour at room temperature. Samples were incubated with primary antibody (1/100) overnight at 4°C. A Cy3®-conjugated anti-rabbit IgG was used as the secondary antibody.